1. Print the reindeer template on beige or white paper and cut the parts out. Glue the head and the antlers on brown card like in the picture left. 2. 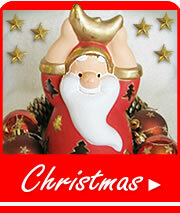 Cut the reindeer out so that brown card forms edges around the reindeer�s head. 3. Spread some glitter glue on the antlers. Draw the lines above eyes and on the ears with glitter glue. 4. Glue the red nose ( a red cap) in the middle. If you have a pair of wiggly eyes children will love them but it�s not necessary. 5. Wrap the treat bags and packages. 6. Print the numbers on paper, cut them out and glue on the bags. 7. Hang all the bags and baggages on the coat hanger. 8. 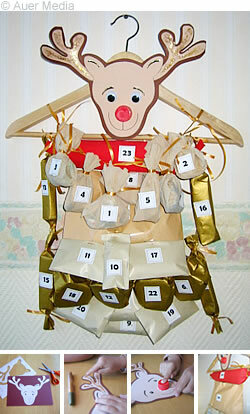 Attach the reindeer head above with tape or ribbon.